equal to a one-day loss of nearly 5,000 points today. Black Monday was more than seven years in the making and threatened nearly every U.S. financial institution. Drawing on superlative archival research and dozens of original interviews Diana B. Henriques weaves a tale of missed opportunities, market delusions, and destructive actions that stretched from the “silver crisis” of 1980 to turf battles in Washington, a poisonous rivalry between the New York Stock Exchange and the Chicago Mercantile Exchange, and the almost-fatal success of two California professors whose idea for reducing market risk spun terribly out of control. As the story hurtles forward, the players struggle to forestall a looming market meltdown and unexpected heroes step in to avert total disaster. For thirty years, investors, regulators, and bankers have failed to heed the lessons of 1987, even as the same patterns have resurfaced, most spectacularly in the financial crisis of 2008. 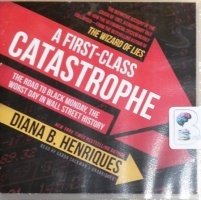 A First-Class Catastrophe offers a new way of looking not only at the past, but at our financial future as well.